Any summer party worth its salt revolves around a beverage. For an easy way to please all your guests, choose a non-alcoholic base that can be enjoyed alone or modified with various spirits. 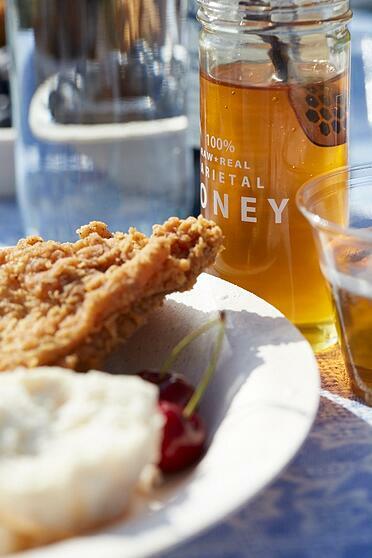 We like our Honey Lemonade, which becomes the Bee's Knees with gin and the Honey Bee with rum. Keep things simple, and consider having guests experiment with their own concoctions. No one likes dousing their body in DEET-based insect repellant, especially when food is involved. Try an all-natural option with simple ingredients, like beeswax-based Bug Balm, and keep your party smelling, tasting and feeling how it should. Look for “long-tail” recipes that taste better after resting overnight, or dishes that make versatile leftovers. Part of keeping entertaining simple involves minimizing clean-up, so you might as well get a few more meals out of those grilled vegetables before having to wash the pan. (Pro tip: try them at room temperature as salad fixings.) Also make homemade spreads your friend—think lemony hummus and baba ganoush. Consider “sauces” here a stand-in for dips, marinades, condiments and salsas as well. Get more mileage out of a dish (say, wings, for example) by switching up the added flavor component. You can always mix and match sauces with other dishes on the table as well. Speaking of diversification, raw varietal honey presents our favorite opportunity to sweeten food healthily while adding complexity of flavor. In short, any time you would normally use processed sugar, choose honey. Making a drink that calls for simple syrup? Honey. Sweetening tea or coffee? Honey. Whipping up a simple vinaigrette? Yep, honey. We love entertaining because nothing animates conversation and creates memories like good food. We gather to share in the bounty, and cheese platters are simple to prepare and unavoidably communal. Pre-cut harder cheeses into grabbable wedges, and don't forget the garnish (remember those herbs). Also, try including sides of different honey varietals. In their quest to find the perfect pairing, your guests will enjoy the journey. How do you like to entertain during the summer? Share your tips in the comments below.